So I opened my Nita Curio file and did some mapping. 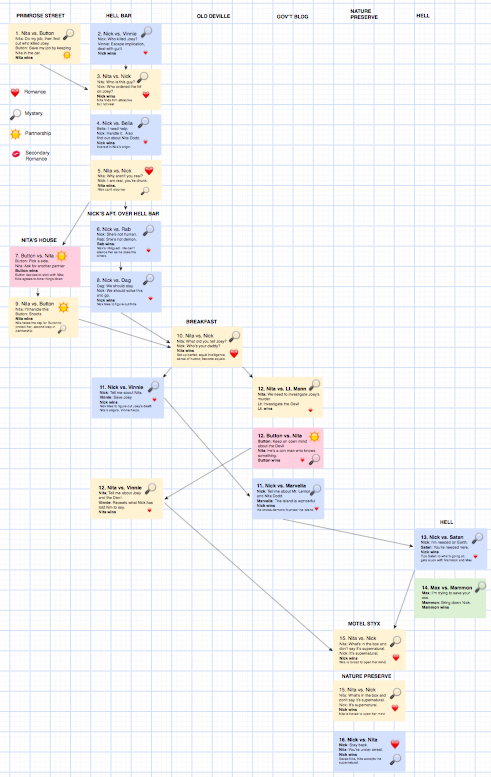 Story mapping for me (not necessarily for anybody else) is taking the essence of a scene–Protagonist and Goal, Antagonist and Goal, who wins, what plot does it move?–and reducing it down to a Curio card, and then arranging the cards in chronological order in columns that identify the setting. My curio cards look like this: So at one glance, I can see that: • It’s Nita’s PoV (yellow background to the box) • The focus of the scene is on solving the mystery (the magnifying glass) • The subtext of the scene is the relationship between Nita and Button (the sun) • What Nita’s focusing on throughout the scene, her goal (do her job, the thing that gives her life meaning). • What Button’s focusing on throughout the scene, her goal (keep her job, the thing that gives her life meaning. 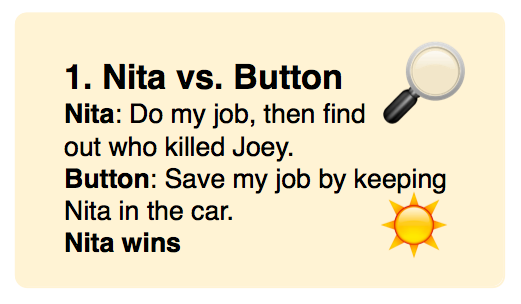 • What climax the scene is heading for (Nita wins and gets out of the car, Button following) Later on, Nita and Button revisit the partnership bit in the car, once they think they’re done investigating for the night: • It’s Button’s PoV (pink background to the box) • The focus of the scene is on the partnership (the sun) • What Button’s focusing on throughout the scene, her goal (which side is best for her career). • What Nita’s focusing on throughout the scene, her goal (setting Button free to save her career). • What climax the scene is heading for (they’re partners heading into danger together; nobody thinks Nita’s going to stay in the car) I can do that all analysis with text, but since there are sixteen scenes in Act One, I can’t see the progression at a glance in text. In Curio, I can. • I can see that Nita has nine scenes and Nick has eight, which is the right balance; Nita’s the protagonist so she should have the edge. • I can see that Button has two scenes which is right for a subplot, and that they’re distributed throughout the act and not clumped. • I can see that Max (green card, bottom right) has one scene and that it happens too late in the act; not sure how to fix that but cogitating. • I can see that they move throughout multiple settings on the island, developing the world in the background of the action, starting on Primrose street with the bar, Nick’s apt. and Nita’s house, then moving to the diner and the rest of retail Deville, then to the government buildings, including the historical society, and then farthest out to Hell and the Nature Preserve, a gradual progression from a closed setting (the bar) to a wild, open setting (Hell and the Nature Preserve) so the reader doesn’t get lost in the shifting scenery bouncing back and forth between settings. • I can see (okay, it’s harder to see in this little graphic but obvious in Curio) that the mystery and love story continue throughout the plot, swapping main plot and subplot roles as the character arc demands. Looking at this, my big structure problem is that Max’s PoV comes in so late. I’ll foreshadow Max to set him up, I can do that in the Belia phone call, but I’m not sure that’s enough, and since Nick can’t go to Hell any earlier, Max is pretty much stuck with a late intro. So lots of foreshadowing. 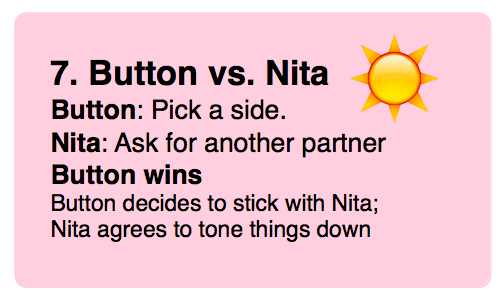 I thought I was introducing Button’s PoV late, but I think I can get away with that since she’s so present in Nita’s scenes. The point here is that I can fix this act because I can see it in this map. It meant cutting the lunch and morgue sequences, but I can either use them in the second act or just lose them forever; this act is tighter without them. One big caveat here: I wrote over 60,000 words before I did this. Don’t start organizing until you’re well into your discovery draft. In this case, I had the first act discovery draft done, but I needed to focus it before I could move on to finishing the discovery drafts of the last three acts. I am not doing this for those three acts yet because I don’t know exactly what’s in them–I have a pretty good idea and a lot of it written, I just don’t know all of it yet–so I have to keep on writing to discover the rest of the story. But now I know what it rests on, so I’m good to go. EDITED TO ADD: Fixed the numbering and added notes as to the time progression, which wouldn’t be on my map, they’re just there for you all. Nifty! Have we already read the lunch and morgue scenes? I remember Nita preordering Nick’s lunch and a morgue scene with Mort. If they are cut and not reused, would you please consider sharing them here? I don’t remember where I cut the last draft off–as they were going into the morgue, maybe? Anyway, the book has shifted, Mort knows more things, and those scenes were crummy anyway. You’re not missing anything. Eventually, I’ll put the whole first act up in truck draft form. I’m talking about truck drafts tomorrow, analyzing the breakfast scene which was also lousy. Oh, I really enjoyed the breakfast scene. It made me hungry for food I wish I could eat without health issues. Hi Jenny – this is very cool! Can you share what the arrows represent? And I think some of the scenes have the same numbers – does that signal something like a POV shift within a scene? I really like how this lets you get a feel for the balance of elements at a glance. Thank you for sharing! Yep, I screwed up the numbering. Fixed it thanks to you. Oh, and I NEVER shift PoV within a scene. Headhopping. ARGH. The arrows follow Nita’s and Nick’s progresses. The first scene (yellow box) is Nita in the car. The second scene (blue box) is Nick in the bar, happening at the same time which is why they’re next to each other. The next scene (yellow box below the blue box) is Nita coming into the bar to question Nick. So there’s an arrow from Nita’s first scene yellow box and from Nick’s second blue scene yellow box to the third scene because they both proceed directly there. Nita doesn’t go into Nick’s blue scene, they both leave their first scenes for the third scene, if that makes sense. Okay, that one’s obvious. But later on, it’s going to be trickier because they’re not together (and Button has a third PoV) and their scenes will overlap not happen exactly concurrently as the first two do, so if I use arrows to track their movements I can see where they are and how they move through the plot. The arrows aren’t crucial, but putting them in helps me catch glitches in the time passage. Meredith, I just added a second graphic that tells what the arrows mean. Wow, thanks! The annotation is really helpful. Kind of in awe of 60k words. Do you mean overall so far or just for act 1? During my draft process, I usually tighten as I go even though I know there will be some changes later. My books tend to be long (over 90K), but I don’t think I have your patience for discovery. Thinking my discovery may be more on the fly. Or sometimes fly by since ideas often hit me when I’m busy doing other very un-writerly things like washing dishes. Overall. Act One was 42K until I turfed lunch and the morgue. The discovery drafting will go a lot faster now (fingers crossed) because I’ve discovered so much in the first 60K. But yeah, there’s a reason why it takes me forever to write a book. I’m slow. I love the Curio layout! Really helps me see how to use it effectively, and will help me map my writing! Thanks for sharing. The amount of crafting that goes into writing well is well worth it. You make me re-read and still feel pleasure at the good story. I don’t get this fancy, but I do some of this BEFORE I start writing, and then review the overall picture between drafts. My initial outline is a spreadsheet that contains a column for each of: scene location, action that moves the plot forward, which plot/subplot is the point of the scene, who the major secondary character is (my stories are all single POV), and what the mystery clue is that’s revealed. It’s not as pretty (no colors), but it functions in much the same way. When I’m creating the initial outline, I can watch to make sure Character A, B or C isn’t clumped or doesn’t show up too late or too often/infrequently. 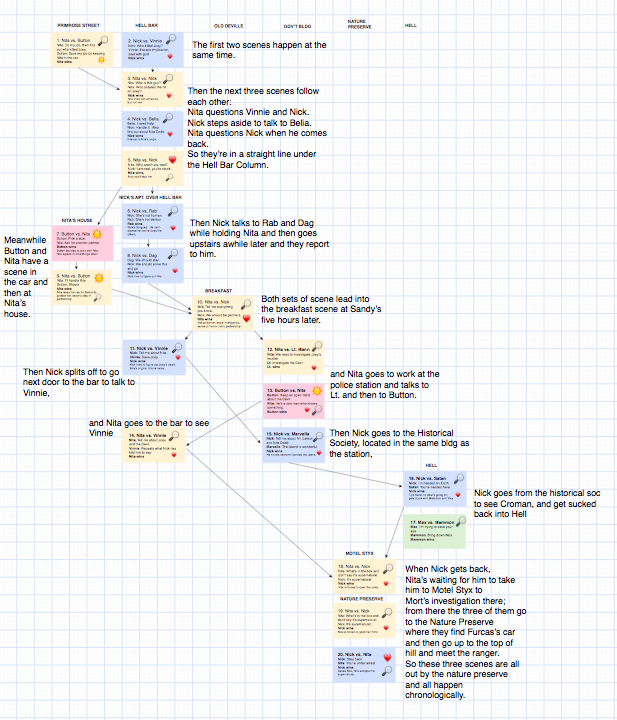 Things change as I write, and I update the spreadsheet, and then look at the big picture between drafts. I’m not sure it even qualifies as an “outline” the way some people view the term. It’s more a matter of prompts and elements that I need to hit, so it leaves a lot of flexibility and discovery for the first draft, while still keeping me from wandering too far astray. Just saying, for anyone who’s more of an outliner, this sort of visual representation of the story can work within that process too. Bob uses spreadsheets, too. We used to stare at each other across a vast divide, incredulous that anybody could work that way. So yep, if you don’t start with discovery drafts, you can start with this. It would kill my process, but it was the best way for him. Love your discovery process. I wish it was easier for you. I guess it’s like pregnancy. Some people breeze through it and for others, it’s a war zone. I looked for more of the WIP to read, but couldn’t find it. I love to read your drafts. I figured everybody had read so many versions of this stuff that nobody was interested in the latest tweaks. Once I get a truck draft of the first act done, I’l put that up.